EU Funds often come with heavy administrative burdens for managing authorities, beneficiaries and everyone involved in their management. In an effort to cut red tape, a number of simplification proposals have been put forward by the Commission to ensure the simplification of control systems, programmes and projects: reducing the number of controls, making EU financial rules simpler and more focused on results. Our Simplification thematic corner brings the latest news and trainings on this issue. You are looking for some real simplification integrating all administrative and technical burdens for soft & infrastructures dimensions ? You want to limit repetitive controls and useless verifications of supporting documents (in particular for staff costs and indirect costs) and to shift to an output & result-based approach ? You want to limit the pressure on Public Procurement and reduce the Error Rate ? You want to speed up absorption and give a better management declaration of assurance taking into account audit recommendations. 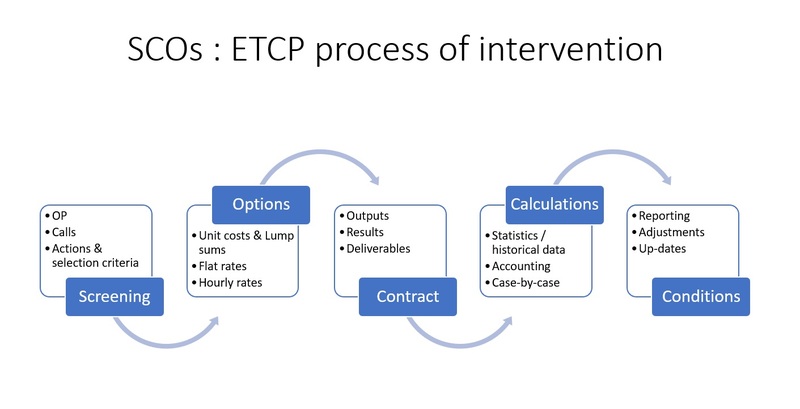 ETCP proposes you a specific tailor made & on site assistance to screen & test together all the possibilities (Unit costs, lump sums, flat rates, hourly rates…) applicable now (following new financial regulation OMNIBUS) and for the next 2021 Programmes. What is being done to simplify EU Funds management?